Being given the opportunity to visit Delta’s Operation Control Center through Kid’s Wish Network’s generosity, definitely grew my passion for pursuing a career in the aviation industry. Our guide for most of my visit, Hampton MacDonald, was very knowledgeable in the inner-workings of Delta’s operations. By far one of my favorite experiences was flying with him in a simulator of an Airbus A320 at Delta’s training center. 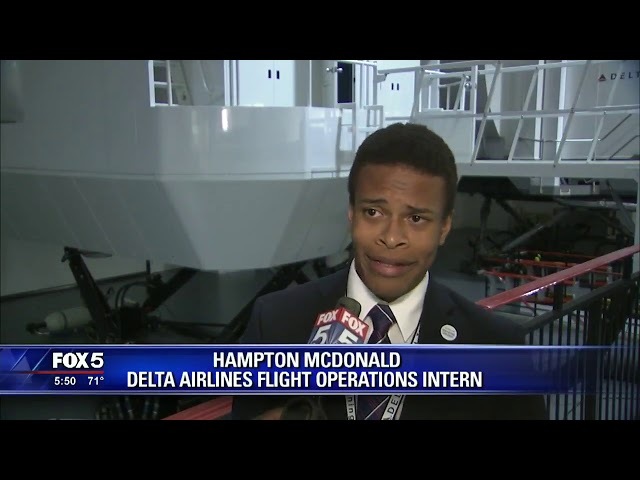 I still keep up with Hampton on social media and he’s since become a pilot for Delta and seeing his posts inspire me even more. Experiencing first-hand how Delta manages their network by coordinating their fleet with their flights is truly amazing. As you walk into the building and see the vast number of employees whose positions range from aircraft dispatchers to crew scheduling you then know how massive their operation is. You could see how world events could impact their operations by different news broadcastings being shown on screens in their headquarters. Having their own meteorologist team on hand gives them a huge advantage over other companies because they can act much quicker and make decisions faster about weather patterns that could possibly impact their operations. You can definitely see why Delta is a highly rated airline in the world with their profound efficiency and top on-time departure percentages. Ever since I could possibly imagine what I wanted to do with my life, I knew I wanted to be a pilot. It has been my long-term goal that I have not given up on. I enjoy every aspect of the aviation industry from keeping up with the latest aircraft to the new routes airlines are operating. As often as I can, I drive to Raleigh-Durham International Airport to watch the airplanes land and takeoff and take pictures of them for hours. I think I am one of the few people that actually enjoy being in an airport because it is never a stressful experience for me. I cannot wait for the day that an airport will feel like my second home as I wait to board and be the one in the cockpit of the aircraft.